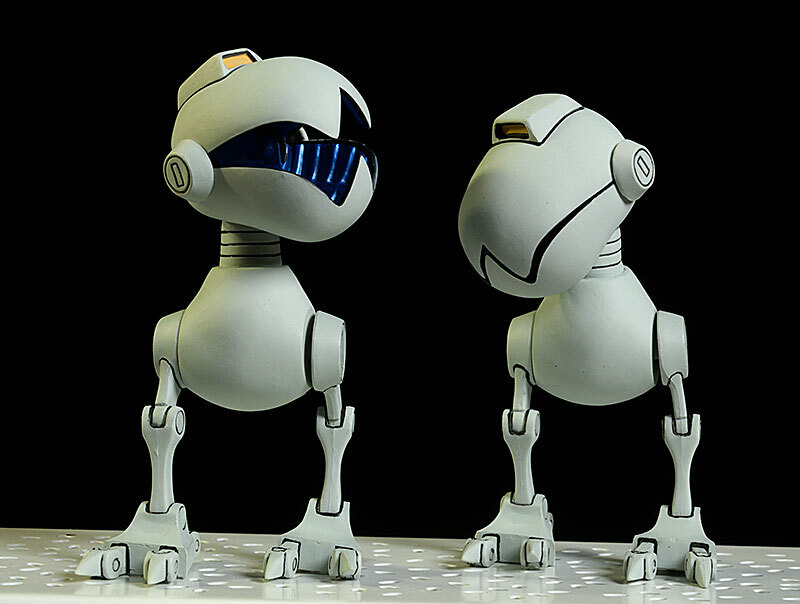 Due to their small size - even in sixth scale, these guys are only about 4" tall - Mondo sold them only in two packs. The regular release, available through many online retailers, will cost you $50. They also did their own exclusive (as they are want to do) which includes three additional accessories, and cost $55. That's the version I'll be reviewing tonight, although the only difference is the accessories. A pretty basic box with a plastic tray inside, the quality of the cardboard and plastic is quite good, both made from heavy stock. The exclusive includes the round sticker on the lower left of the front of the box, but there's no Certificate of Authenticity or other edition size indication. 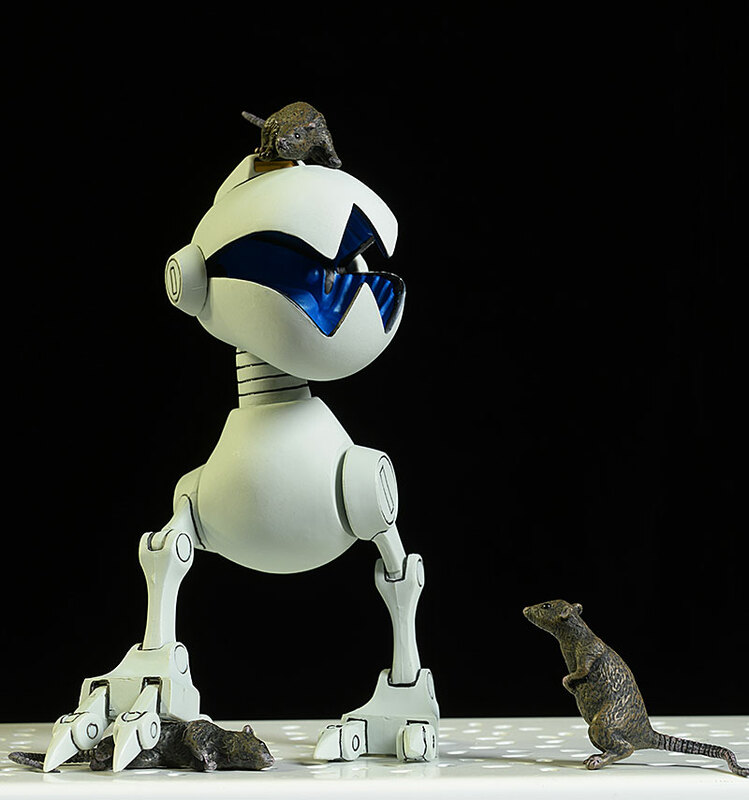 These mousers are based on the comic, just like the Mondo turtles of the same scale. As I mentioned, they are 'sixth scale', so they can fit appropriately into the display with the Mondo Leo, Don, Mike, and Raph. These come in around 4" tall, depending on how you pose the legs and head of course. 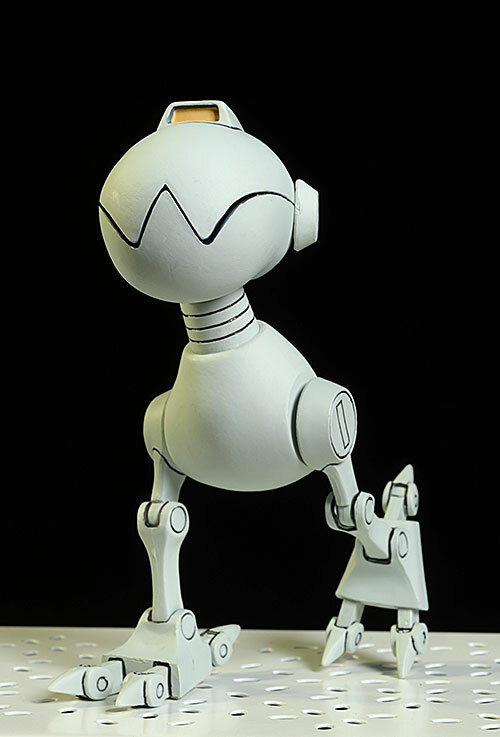 Because they are supposed to be smooth metal robots, there's not a lot of sculpted detail. However, Mondo made sure to carve all the black lines into the surface, giving more depth and detail to the appearance. The interior of the mouth is ribbed, with more detail than most of the exterior. A big plus for the sculpt is how well it integrates with the articulation, giving you the best of both worlds. They could have easily skipped the joints and pre-posed these, claiming any articulation would ruin the look, but instead they found a way to make it work. The paint does let the sculpt down a bit, although it's still reasonable quality. 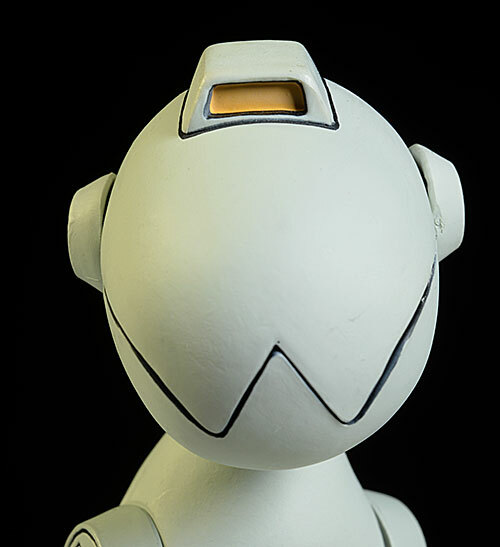 The off white 'skin' is clean and consistent, but the paint has a bit more texture to it than a metal robot would probably exhibit. The black lines are a little wavy in spots, with a slip here or there and some inconsistent coverage. None of this is awful, but it's not at the quality level we saw with their First Turtle vinyl figure. Perhaps the best paint feature is the bright, metallic interior of the mouth. It's clean and consistent, and creates the right material impression. There's not a lot more they could have done in terms of articulation, considering the design of the robot. 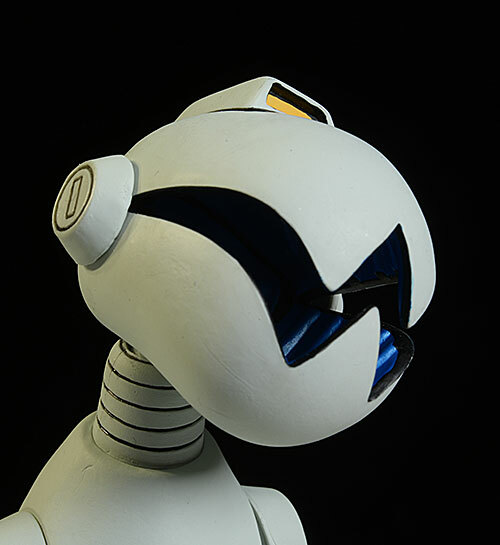 The ball jointed neck works fantastic, with a tremendous range of movement thanks to the thinner neck. Without much emotion in the 'face', having the ability to add personality and attitude through the pose of the head is a big plus. The mouth opens wide as well, revealing the blue lining. This works pretty well, although one of the two mousers as able to open its mouth wider and close it tighter than the other. 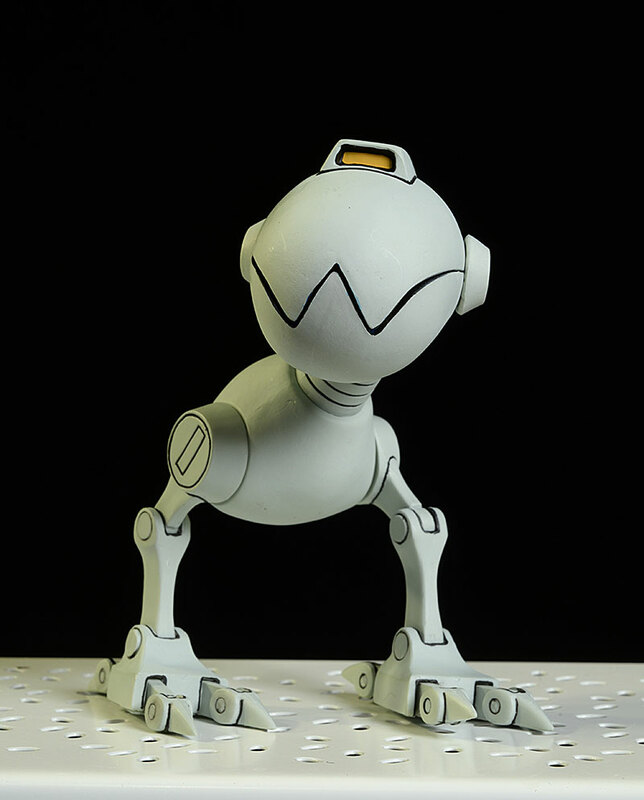 The big articulation comes in the legs, where there is a cut joint at the hip, a pin joint at the knee, another pin joint at the ankle, and 12 more pin joints in the 'toes'. Each toe has a pin at the foot and at the mid point, and all these joints have a decent range of movement. If I had one nit, it would be with the ankles, which I wish moved a bit further forward, but I was still able to get plenty of excellent leg poses. You could argue that the one thing missing from the legs is any inward and outward movement, which would allow you to turn the foot and/or leg. However, I can't see any way they could have done that without damaging the look and lines of the sculpt, and the solution they provided should give enough articulation to make you happy, while maintaining an excellent appearance. If you pick up the regular release, this category gets a big bupkis. 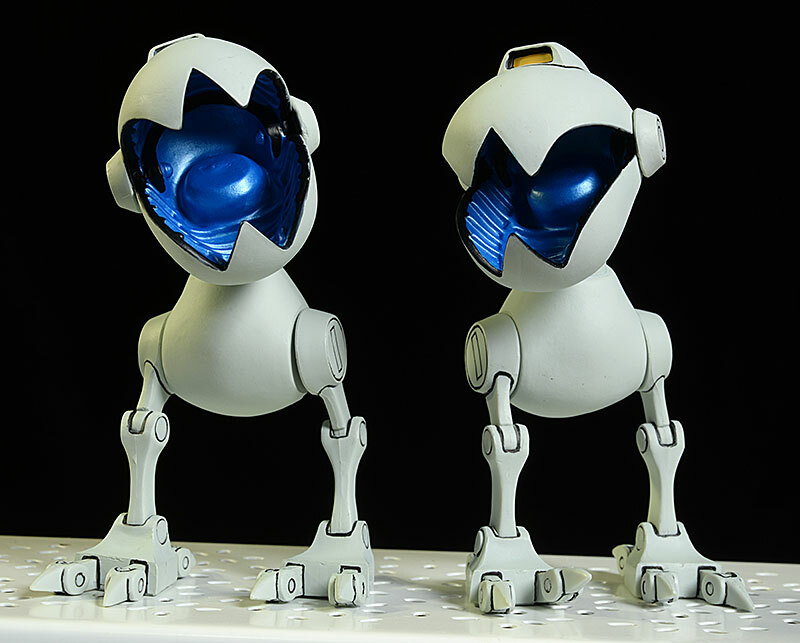 There's nothing additional added to the two non-exclusive Mousers. However, the exclusive release includes three rats. 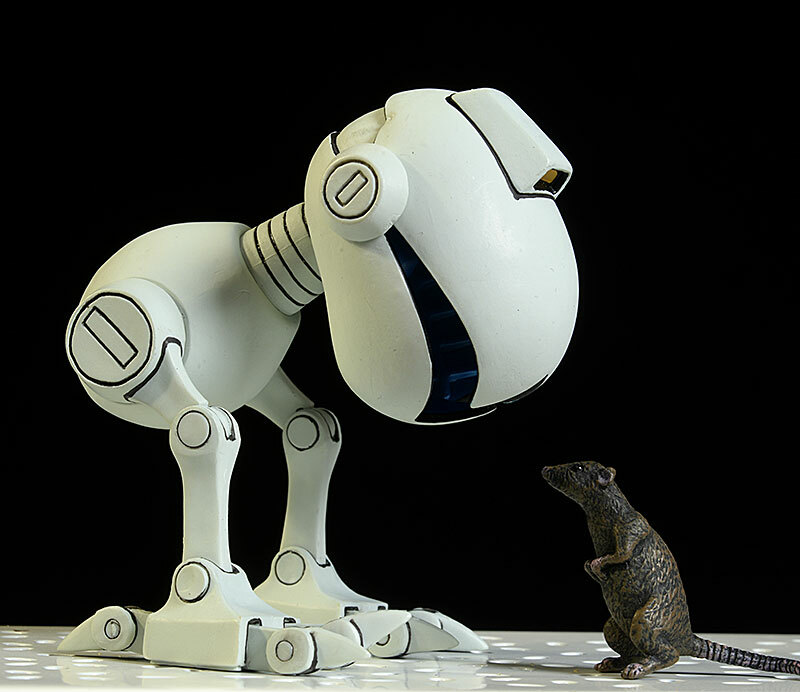 Remember, the non-evil goal originally intended for the Mousers was to kill rats, despite their name. The three rats are in different poses: one is standing up sniffing; one is down close to the ground, most likely sniffing; one is laying on his side, most definitely not sniffing. 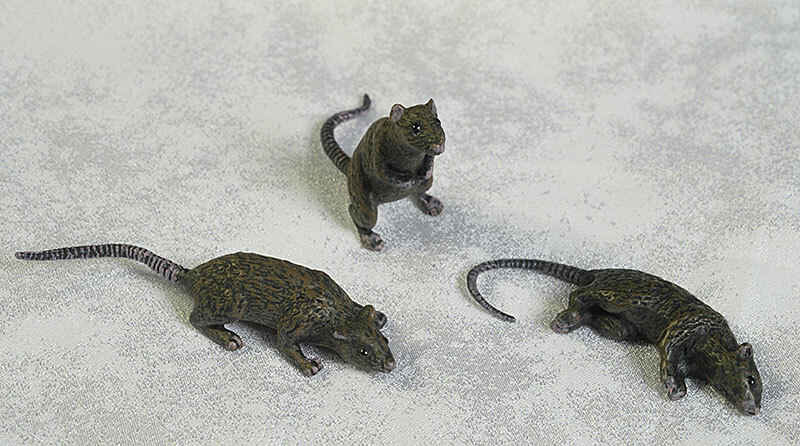 There's a ton of ways to add these to the display and use them with the Mousers (or the Turtles themselves for that matter), but let's be honest - you can probably find yourself some sixth scale rats that are just as good in terms of sculpt and paint at the local dollar store. Originally it was only $5 more to get the exclusive, and while the rats are pretty standard stuff, you were also getting the exclusive label and there's also some value to that. But I wouldn't spend big bucks on the after market for this simple addition. Thanks to the excellent articulation, these are a ton of fun. You can find all kinds of great poses for them, and the rats make for some great combo set ups. There's also no fear of breaking or damaging anything, making it more likely that you'll pose and re-pose over time. The price tag of $55 ($50 for the regular release) is a bit steep, considering the size of these guys. You're paying $25 for what is essentially a 4 - 5" figure. I'm going to cut them a little slack because everything here - sculpt, paint, articulation - is well above average, AND it's almost certain that the production numbers on these is pretty low. Let's face it, if you aren't buying the 1/6th turtles, you aren't buying these, and the production numbers on the turtles themselves is pretty low comparatively speaking. Not much. It took a little careful work to get all 12 joints in the six 'toes' to work freely, but I was never concerned about breakage or damage. If you're not buying the Mondo Turtles, I doubt you'll be interested in the Mondo Mousers. Let's face it - one without the other doesn't really work. And you don't really NEED to have the Mousers, even if you get all four turtles. They really are just an add on for the die hard fans, something to spice up the overall display. And as such they do a great job. 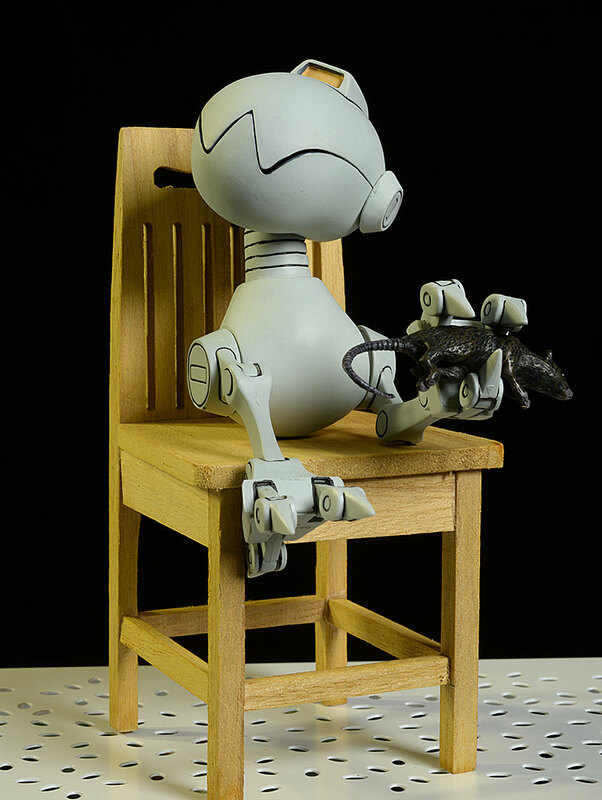 They're a ton of fun, and much more poseable than the overall robot design might indicate. 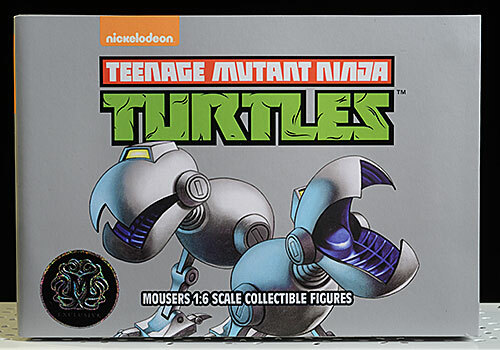 Turtle-mania is definitely alive and well, and it's great to see fans getting quality collectibles in multiple scales from multiple companies. It's a terrific time to be a shell head! - originally these were available at the Mondo store where the regular two pack was $50, and the exclusive was $55. - has the regular set, sans rats, for $50. - also has the regular two pack for $50. - Entertainment Earth also has the regular for $50. - if you want the exclusive now, your best bet is to search ebay for a deal. 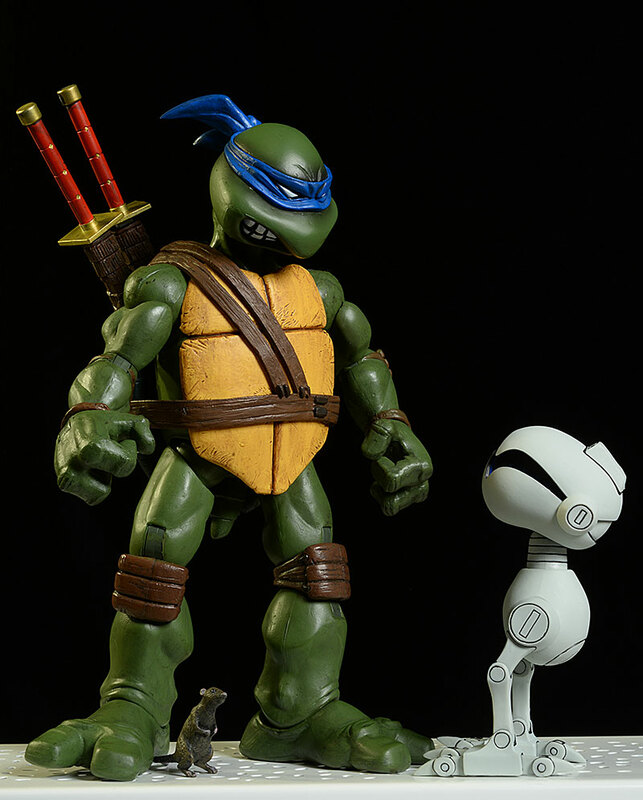 So far Mondo has released one of the four turtles in this scale, with the other three coming soon. I reviewed Leonardo when he hit.